One of the five foundational self love promises is to NEVER SETTLE FOR LESS THAN YOUR HEART AND SOUL DESIRE… are you keeping this promise to yourself? Watch this video and press pause on the outside world to tune into your inner world and do a check in with your heart. Most of us never slow down enough to truly tune into our hearts so we have no idea what it truly desires. And sometimes when we do know what it desires we are too scared to actually admit that we desire it. We feel selfish, like it’s too much. Or we feel like it’s impossible or impractical so we just stuff the desire down and get on with our rational lives, settling for less than our heart desire, and in the process letting ourselves down, which is so not self-loving. The self-love truth is that if you can FEEL it in your heart, then desiring it can only be a good thing that creates more goodness and more love for the world. Even if it’s big. Even if it seems alot. Even if other people have judgments about it. The test is to make sure the desire truly comes from your heart and soul, and not your ego, which NEEDS and WANTS things to make you feel safe, enough and like you belong. How do you do name and claim your heart desire? 1. Watch the video and listen to your heart – and let my words touch your heart, and then listen to what it tells you – you may be surprised! 2. Two, when you state your desire out loud and write it down so you can see it use the words “I DESIRE” instead of I WANT – want denotes lack, like you are not whole without this thing. And when acting in alignment with your heart, you’ve got to do it from a place of you are whole already. For example, saying “I want to be famous” (ego) is different than “I desire to shine as bright as I can, to be the star I am, so that my love and expression can light up this world. I desire to be a shining star whose light people from around the world see and are inspired by.” Or saying, “I want a soul mate so I can be loved” is saying that you are not loved already, which you are. Instead, you may very well desire a partner to share your life with, so “I desire a partner to share my full life with” denotes you already know your life is full before he/she shows up. 3. After you watch this video – claim your current heart’s desire… then EXCLAIM in here, right here on the self-love blog… I will be here to witness it and you and fill it up with the love and light of the full moon! Okay your turn… post it here… and then keep your self love promise to open your heart to receive it. You don’t need to know how or when, you just have to be open to receive the love in whatever expression the divine has in store for you. 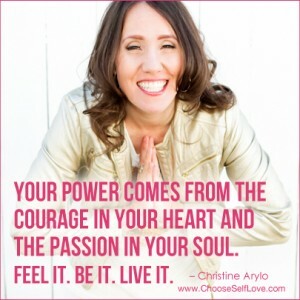 This entry was posted in Self-Empowerment, Self-Expression and tagged arylo, christine arylo, loving myself, madly in love with me, self love, self love blog, self love promise, self love video on September 10, 2014 by Christine Arylo. Watch this video & get the 4 questions to ask your heart and soul so you create a year you LOVE! It can be hard to hear your heart and soul – it can feel daunting, and you can get stuck in your brain real fast. And you can also short circuit yourself because of fear. Which is why I invented this AWESOME LOVE FILLED GAME for finding your Heart & Soul Goals, and creating a year motivated by LOVE not pressure, fear or lack. I’ve been playing this game all week — with Noah, at dinner with friends, and last night we had a Dream Party where we all played it and then painted our heart and soul desires on our windows! And now I will share it with you (window painting is optional). The game is based on 4 core questions that help you get into your heart and soul DESIRES (desire means “from the stars” – in other words you co-create with Spirit instead of from want, lack or fear). “In 2014, I desire to FEEL” — and before you talk or write, put your hand on your heart, close your eyes, take a breath and then just write or say what comes — no thinking it, FEEL it or SEE it… and let it emerge. The best is when you just let the energy rip out of you talking or writing and YOU surprise yourself. 1. Use the word DESIRE not words like “like to have” “want to do” – want comes from lack, like from a place of not deserving – that is so not self-love! So when you state these desires, it’s about coming from wholeness and enoughness. You already have access to all of this inside of you and through your connection to spirit. Desire means ‘From the stars’ so using this word invokes the truth that you are A. Aligning with Divine Will and B. Co Creating with the Divine. This isn’t about magical thinking or hopeful manifesting, but getting yourself into alignment with your heart and soul’s wisdom. When you do that, you create your year instead of pressure fill it. 2. January is the DREAMING TIME, February the Seeding Time – so play with these questions all month/moon long. This January holds a full cycle of the moon, which from a divine feminine perspective is really awesome and powerful. because when we create in conjunction with the moon cycle, we create realities that make harmony in our lives instead of stress. Now your turn… post it here on the blog. And remember, the Inner Mean Girl 40-day cleanse starts on January 12th – clear your mind of toxins like Comparison, Guilt and Fear… Go to www.InnerMeanGirlCleanse.com for the divine details! This entry was posted in Self-Empowerment, Self-Expression, Self-Worth, Uncategorized and tagged christine arylo, goal setting, self empowerment, self expression, self love, self worth, soul goal came, soul goals, spiritual goal setting on January 5, 2014 by Christine Arylo. This entry was posted in Self-Expression and tagged christine arylo, happiness video, how do i find love, how to be happy, i feel alone, madly in love with me, self love, what to do when i feel lonely on November 22, 2012 by Christine Arylo. Feeling Shy but Wanting to Shine? Dare to do this! Dare to SHINE! Do this dare and you will break through the fear that keeps you from shining your brilliance from a place of pure love. This entry was posted in Self-Expression and tagged christine arylo, how do i love myself, madly in love with me, self love, self love tv on November 16, 2012 by Christine Arylo.